The telecommunication industry has always been developing with leaps and bounds and technology changes with each passing day. For common people with few network knowledge, the evolving optional network devices like PoE switch can be a big puzzle. What is PoE? What is the distinction of gigabit PoE switch vs normal switch? Read this article for reference. What Are PoE and PoE Switch? PoE, abbreviation of Power over Ethernet, is a technology that enables Ethernet cable to supply power. Thus power sourcing equipment (PSE) can transmit both data and power to powered devices (PD) simultaneously via one single cable. 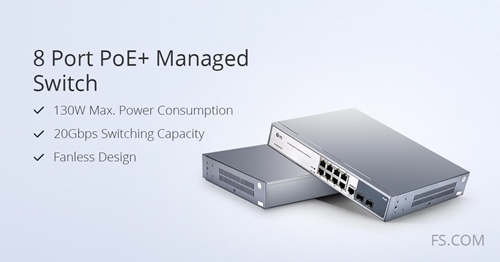 PoE has two standards available on network switch: IEEE 802.3af/at. The former orginal PoE standard is defined in 2003, which provides 15.4 W power budget to PDs (12.95 W available for accessing). The latter PoE+/PoE Plus standard defined in 2009 provides up to 30 W (25.5 W) power. PoE switch is one of the two types of PSE for PoE implement: endspan switch and midspan PoE injector. To enhance network resiliency, gigabit PoE switches provided by FS.COM are highly compatible IEEE 802.3af/at managed PoE+ switches. For example, S1130-8T2F managed gigabit 8 port PoE switch with 2 SFP ports can connect to gigabit Ethernet network while S1600-48T4S 48 port PoE switch can use the SFP+ ports to connect with 10gbe switch for higher performance data transfer. Figure 1: FS S1130-8T2F 8 port PoE managed switch can be flexibly placed in a rack, on a wall or on desktop. PoE Switch vs Normal Switch: What’s the Difference? In a word, PoE switch and normal switch differ from PoE accessibility. A regular Ethernet switch is not PoE enabled to supply power for end users over Ethernet. Therefore the user requires one extra cable to connect power outlets. However a normal switch can also become PoE ready by employing a midspan injector between the switch and PDs. The injector will add electrical power while receiving data signal from Ethernet switch end cable, and then deliver both data and power to PDs. But in this circumstance the injector also needs a wire for power. When using gigabit PoE switch, only one power cable is required. Then the PDs can be directly plugged into the PoE gigabit switch port for both data transmission and power supply. 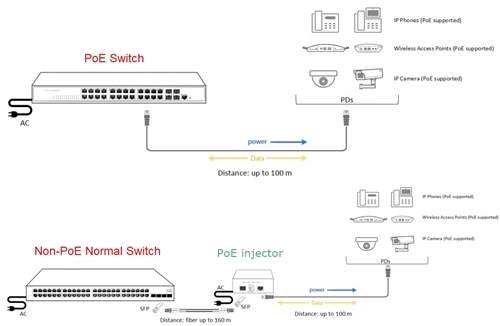 The illustration and table below list the differences of employing PoE switch vs normal switch while adding PoE to network. Figure 2: An illustration of deploying PoE gigabit switch vs normal switch when adding PoE to network. What Are the Advantages of PoE Switch? As mentioned above, PoE switch differs from normal switch for supplying power to PDs in the meantime of data delivery. Though the normal switch system can also acquire PoE by installing injector, PoE endspan has the superiority of direct Power over Ethernet ability. Counting to this, gigabit PoE switch owns edges over normal switch as follows. First, it enables PDs like IP surveillance cameras to be placed almost anywhere: on the ceiling, concealed in a wall, or even underwater while only one cable is needed to run to them. Second, it saves extra expanse and time for power cabling and injector installation. Third, with simplified cabling of all PDs directly connected to gigabit PoE switch, the data center is easy for management and control. Besides, PoE gigabit switch itself is designed with advanced features like high-performance hardware with software, auto-sensing PoE compatibility, strong network security and environmental adaptability. Gigabit PoE switch can supply power to PDs in the meantime of data transmission via one single Ethernet cable while normal switch can only send data to them. For PoE implement, normal switch requires a power-on auxiliary injector as midspan between switch and powered devices. Thus PoE switch owns advantages of direct PoE connection, easy and flexible placement, cost-efficiency, simplified management and etc. For any applications of IP surveillance cameras, VoIP phones and wireless APs, PoE switch over normal switch is a good solution to go. This entry was posted in Ethernet switch and tagged 10gbe switch, 8 port PoE switch, gigabit PoE switch, PoE switch by Sylvie.Liu. Bookmark the permalink.